This resolution is coming to you on National Bubble Bath Day (let’s give it up for the Instagram Holidays!). We couldn’t be more excited to share how we take care of ourselves. We’re also excited to wrap up the New Year’s Resolution series with this one because, well, love thyself. We think this bath has a very pleasant scent- some “ocean” scented products tend to miss the mark in balancing a salty and sweet smell. This just smells like a sweet lotion you might wear to the beach. It has moisturizing components and gives a decent amount of bubbles. We will be indulging with this! Great dupe! 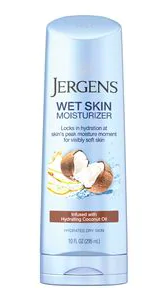 Very slightly different smells as Jergens is more floral and beauty 360 is a fresh scent. Both are nice!